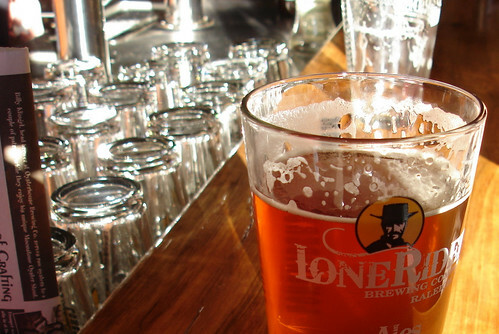 LoneRider Brewing Company – Beer So Good It Should Be Outlawed! Ok, I know I have had a lot of posts about beer lately and this blog really isn’t all about beer, but I finally got over to the LoneRider Brewing Co. with a friend of mine this past Saturday and want to share my thoughts. I have no idea why it has taken me this long to check out such a cool place. Afterall, it did open up well over a year ago right here in Raleigh and is not all that far from where I live. 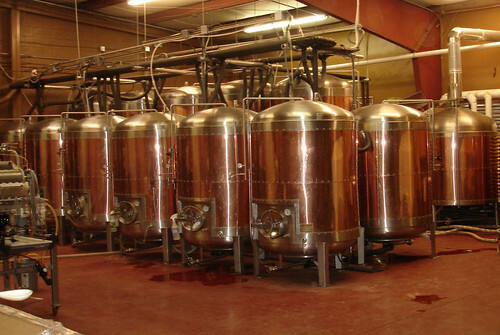 The Brewery itself is situated in a warehouse located just off of Westgate Boulevard near where I-540 connects with Glenwood Avenue in the vicinity of Brier Creek. The story behind LoneRider is inspiring. The three owners are friends who connected through their shared interest in home brewing. Each works an 8-5 job yet they somehow found the time to pursue their dream of opening and running a great local brewery. I met one of the owners, Steve, on my visit and enjoyed learning about the brewery’s history. Steve and the other staff at LoneRider were very friendly and gracious in answering my various newbie beer questions. I left there knowing a whole lot more about how good beer is made than before I had entered their “Hideout”. 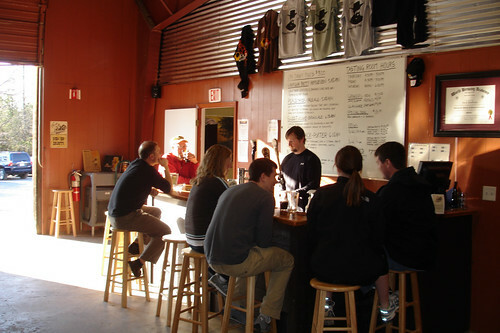 LoneRider holds brewery tours on alternating Fridays and Saturdays and also have a tasting room that is open Thursday-Saturday (check their website for tour info and tasting room hours). I haven’t been on a tour yet, but I hear they can draw quite crowd. The tasting room is fantastic in its simplicity. It is comprised of an inviting little bar with taps for all of their beers and in what appears to be the loading bay for the brewery complete with a loading dock door opening to the parking lot giving the tasting bar a “drop in and say hello” feel. While my friend and I sat at the bar drinking our pints I was intrigued by the number of people who dropped by to get their “growlers” filled up. One guy even drove up in his Harley and pulled two empty growlers out of the saddle bags on his bike. 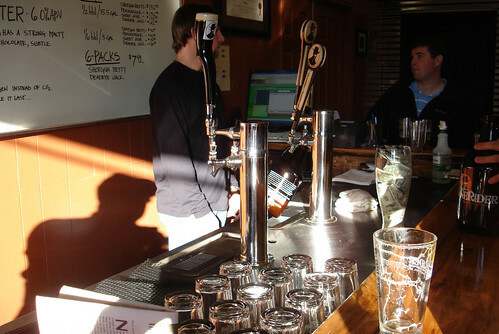 In addtion to the regualr draught beers, they also offer their beer on a “Nitro Tap” meaning the beer is served using compressed nitrogen instead of CO2 . Apparently this gives the beer a different texture and tast. I didn’t try that on this visit but may experiment with it on a future visit. 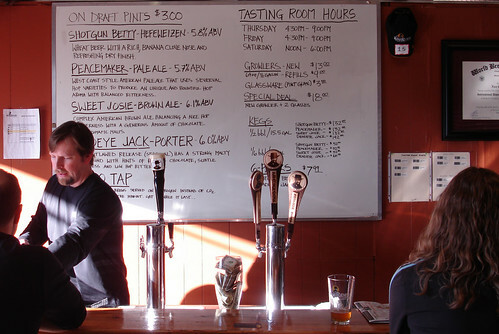 When we stopped by they had their Shotgun Betty (hefeweizen), Peacemaker (pale ale), and Deadeye Jack (porter) on tap. They also have a tap for Sweet Josie Brown, their brown ale, but they were out of it on my visit but should have more within the next day or two. I am very new to the beer tasting scene and don’t pretend to have a sophistacted palate so take my comment on the beers with that in mind! That being said, I found the Shotgun Betty to be a very tasty wheat beer. It had that nice orange cloudy look of a hefeweizen but a unique somewhat sweet flavor with a hint of banana and citrus. My friend tried their Porter which had the classic rich dark look and a taste dominated by coffee and roasted chocolate. My friend and I both had a couple of pints of the Peacemaker Pale Ale and agreed it was extremely good. As I sit here writing this, I can’t quite find the words to describe it. It was very different from anything I’ve ever had before. I guess I will just have to go back and try it again to develop an adequate review! Let’s just say it was one of the best beers I have had in a while! In the end, off the three beers I tried, my favorite is the Peacemaker pale ale with Shotgun Betty coming in as a close second. I’m sure my appreciation of the Dead Eye Jack will grow as my beer palate matures. It certainly seemed popular with the other people there that day! In addition to getting a pint at the bar for a very reasonable $3 or filling up a growler ($13 for a new one, $9 for a refill) they now sell six-packs if Shotgun Betty and Deadeye Jack. Word has it that in addition to picking up a six pack at the brewery, you should now be able to find six-packs in the local Harris Teeters and Whole Foods. I know they are already carrying it at Taylor’s BP in North Raleigh. 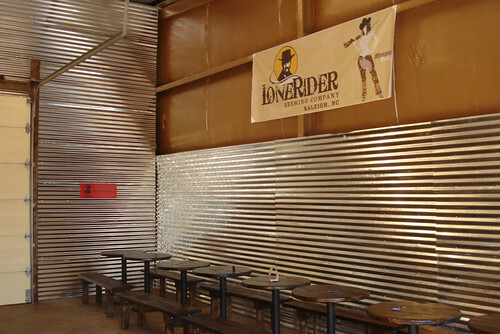 You can also find LoneRider Beers on tap at various bars and restaurants around the Triangle (around 80 so far) including places like The Pit, The Flying Saucer, and Brixx Pizza. As I mentioned in my previous post about the Rialto, the Theater now offers Shotgun Betty as one of the beers you can enjoy while catching a movie. LoneRider also holds a cool annual event called “Brew it Forward” where local home brewers compete to have their beer selected to be brewed at Lone Rider for a limited time. I think last year’s winner was a Pilsner that is due to be ready later next month. There were around 85 homebrews submitted for consideration in 2009 so I’m sure the 2010 competition will be fierce. This year’s Brew it Forward event is scheduled for March 27th. For more info about the event and instrcutions on how to submit a beer to be juedged check out the event website. From top to bottom LoneRider is a great addition to Raleigh and the local beer scene. Not only do they make some great beers there, but their tasting room is a unique and fun place to visit and I look forward to stopping by there as often as I can. For more information about the guys behind LoneRider and the inspiration behind starting their own brewery check out this article from Know Your Brewer. Thanks for the great write-up on our brewery. We’re very grateful for enthusiasts like you. We wish you the best with your blog. Mentioned you on our facebook page. Please, stop by the brewery any time! Thanks for stopping by. I really appreciate the mention on facebook. I will definitely be back to the tasting room. You guys have a great set up and it is a nice environment to chill and enjoy a great beer. I’m looking forward to many future visits and growler refills this summer. Oh, yeah …. you guys got my vote in the 2010 Best Of Poll! Had the Peacemaker on tap at CueGrass on West Davie this past weekend. I was impressed. They struck a balance between the oh so delicious hop-forward notes that pale ales are built on, and a nice smooth malty finish. I’ll be looking for your brews for a nice relaxing Friday night tasting session here in North Raleigh. Keep up the good work! Thanks for stopping by. I was at Cuegrass this weekend too and had some Peacemaker myself. It was awesome. I can’t wait until they start selling it in bottles in the stores!